Initially, Wax prints were designed and produced in Holland for the Indonesian market as an alternative to batik. When the sales were not as high as expected another outlet was needed for the fabric. Africa was the destination and it was greatly received, Partly for the vivid colours but mainly for the unique patterns and styles. Since then, wax prints have become a staple in African fashion for head ties to full garments Wax fabric is a very versatile cut and super easy to work with. Here are a few of our top tips for working with Wax Print fabric. Washing wax prints can be quite tricky due to the nature of having wax embedded in the fabric. Spot tests are key to ensuring a good wash. Place a piece of white cloth over a discreet area of the print and gently heat with an iron. If the colour stays then you should be okay to wash. If the colour transfers then it will be best to have your garments professionally cleaned. Machine washing your wax prints is the simplest method, providing they held up to a colour test mentioned above. Set your machine to a cycle that is no hotter than 30°c and with no spin. Make sure to wash wax prints together and not with any other garment to protect from colour runs. Once the cycle has finished hang out your prints to dry with loose pegs to stop any marks forming. After the fabrics have fully dried gently iron them flat and fold for storage. Most professional dry cleaners will have experience working with wax prints but it is always worth phoning ahead to get recommendations and check if they are comfortable cleaning your wax prints. This is especially prevalent when taking a large number of prints to be cleaned at the same time. Most fabrics will come with a label on. The quickest and safest way to remove the label is to place a piece of fabric over the label and gently heat with an iron to loosen any glue and peel the sticker off. This should leave a residue-free area where the sticker was. All of our wax prints are double sided and have vibrant colours on the underside too, these can be flipped and worn this way too to create interesting contrasts against the main side of the fabric. We can’t stress this enough, although all of our wax prints come in a generous 6 Yard length, being precise with your cuts can help you get the most of a single piece of fabric. We love to see new and exciting designs. Don’t be afraid to mix and match various fabrics in one garment. 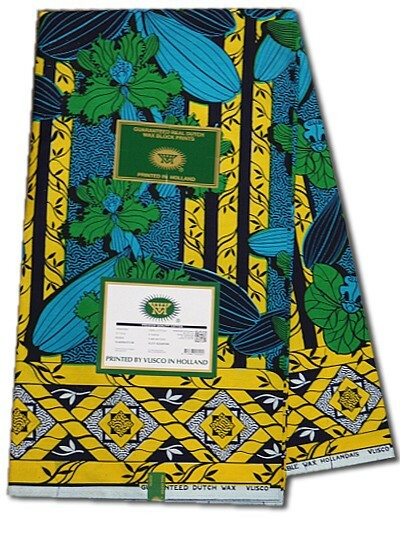 Such as our new lace wax and a Vlisco wax print for a stand out dress or skirt that no one has ever seen before.